PrecisionLender permits you to set up products with custom assumption sets for specific regions you select. This customization is easy to accomplish. As a System Administrator, click Administration, then Products. To create a product, click New (or the copy icon next to an existing product), or edit an existing product by clicking on its name and then clicking Edit in the upper left of the product setup screen that opens. After you click Edit, the option to "Split Out Region" will appear (an example screen is shown below). Click the Split Out Region to open a box showing all your regions. 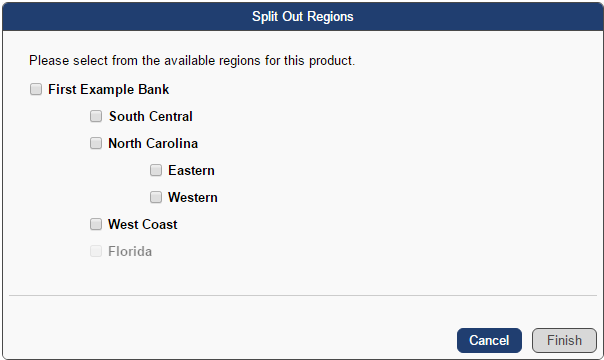 Selecting a region within the Split Out Region box will create a new tab for the product assumptions specific to that region. (Tip: Select the region at the highest level that suits your needs, as selecting a region with sub-regions will bring those sub-regions with it.) Checking "Enabled" in the product setup screen will have that product appear as an offering in the drop down box that lenders see when they click New Opportunity; if you do not want the product to appear for certain regions, make sure the "Enabled" box is not checked. Once you are satisfied with the new product region and its assumptions, be sure to click Save in the upper left of the product setup screen to save your changes. Clicking the same tab on a product that already has customized regional offerings will permit you to merge those regions back into the “main” product should your needs change in the future.